One of the most sublimely assembled jazz orchestra's of the 21st Century. Joyful. After spending more than a year writing music in my "free time" over a period of two months, the first week of September 2014 we concentrated an intensive week of rehearsals and recording of the 'Jazz Cava de Terrassa' which will certainly be the most important musical project of my career. I have recorded many albums as sideman, but never in my name, this is the first time my name is in the record field and my hopes are high! 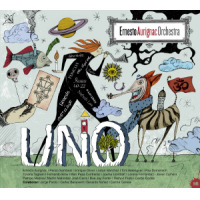 The band is called 'Ernesto Aurignac Orchestra' and the album title is 'UNO'. 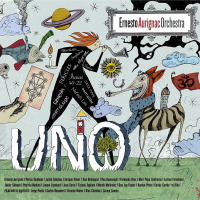 I was lucky enough to have a band from another galaxy, it is an unusual talent collective that gives life to my music, 19 musicians are part of this great production: Ernesto Aurignac: tenor and alto sax; Perico Sambeat: soprano and alto sax; Enrique Oliver: tenor sax; Julián Sánchez: trumpet and flugelhorn; Toni Belenguer: trombone; Fernando Brox: flute; Pepa Mari Contreras: oboe and English horn; Pau Domenech: bass clarinet; Lorena Fernández: horn; Javier Cámara: horn; Martin Melendez: cello; Tiziana Tagliani: harp; Jaume Llombart: guitar; Joseph Carra: piano and Rhodes; Jay Dee Foster: bass; Ramon Prats: drums; Carlos Cortés: percussion; Gerardo Núñez: flamenco guitar; Theme voice: Surprise! !